Each year in February, the cities of Ottawa, Ontario, and Gatineau, Quebec hosts one of the greatest winter festivals in Canada, Winterlude. Before we were even married, Kevin and I have been making the trek up north for a fun weekend in the frost. Since having the boys, Winterlude with kids has become even more special. Here is why we love it SO much! 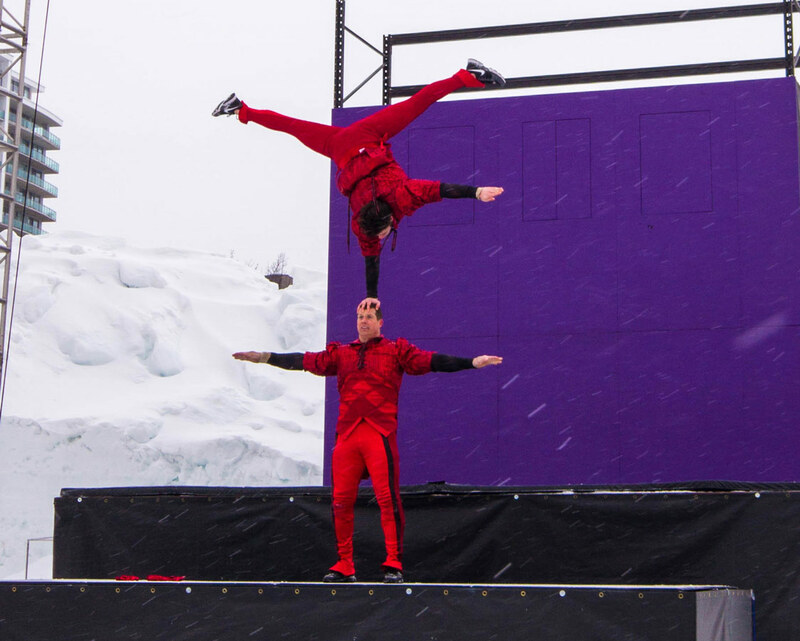 For three weeks in February, central Ottawa and nearby Gatineau, transform into a winter wonderland full of frosty fun, amazing shows, and interactive entertainment. 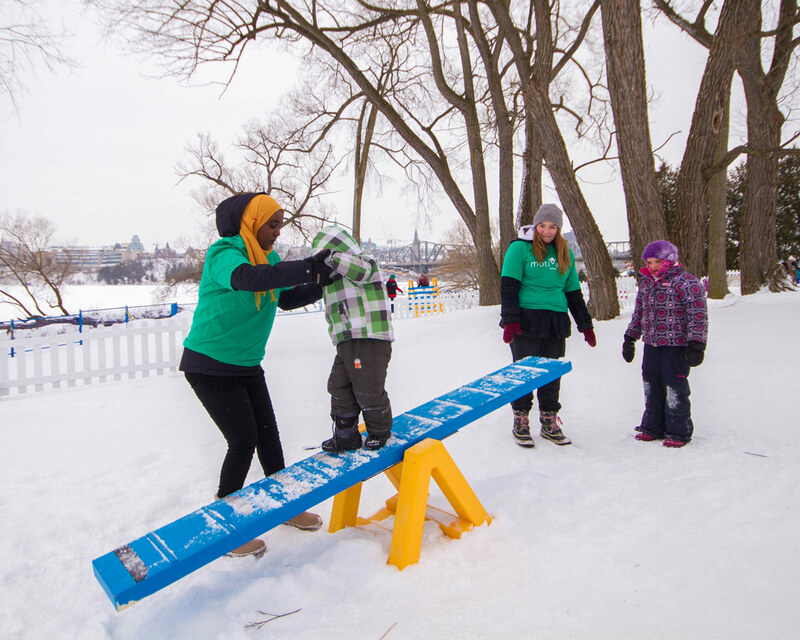 Launched in 1979, Winterlude is organized by the Department of Heritage and is filled with classic Canadian winter activities. 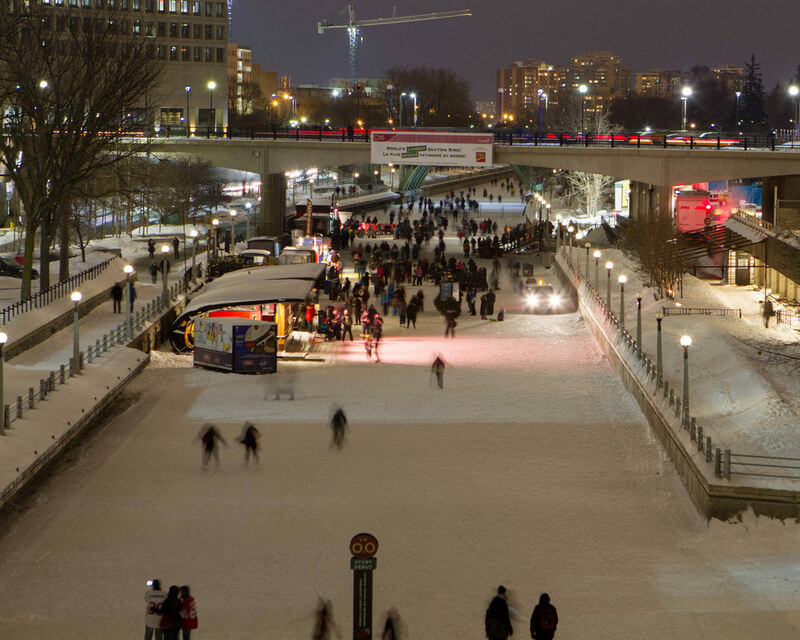 The Rideau Canal Skateway is 7.8km long and is one of the highlights of Winterlude. When the temperature drops, the canal transforms into one of the largest skating rinks in the world. Also, amenities are never too far away. Along the canal are washroom facilities and food vendors. No skates? No problem! Skate rentals and even skate sharpening are available at the canal. For those that don’t want to skate there are other activities on offer. For example, the Winterlude Triathlon and the annual bed race. New this year in 2017, there was even an Ice Dragon Boat Festival. Pro-Tip: We like to bring along a sled that we use to carry our stuff around. Found in the Snowflake Kingdom in Jacques-Cartier Park, Gatineau, are three giant ice slides. The Iceberg and Glacier section is for solo sliders and also has other lanes that are wide enough to fit several people across (perfect for a family slide). Pro-Tip: It is highly recommended to have waterproof pants when going on the ice slides and many of the other activities in Winterlude. In case trudging through the snow was not burning off enough energy, there is also a kids size obstacle course in the Snowflake Kingdom. There were many volunteers along the way, so even our 3-year-old, was able to complete the course. He was so proud of himself! 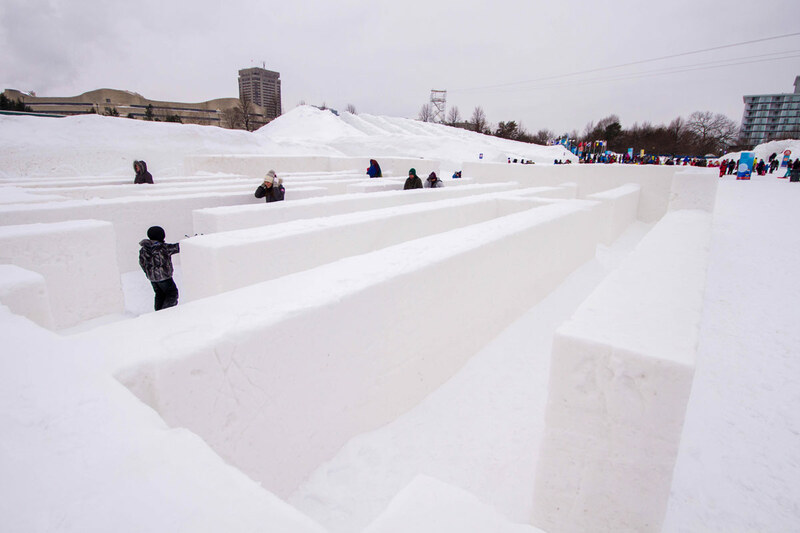 New this year was a giant snow maze called the Canada150 maze. 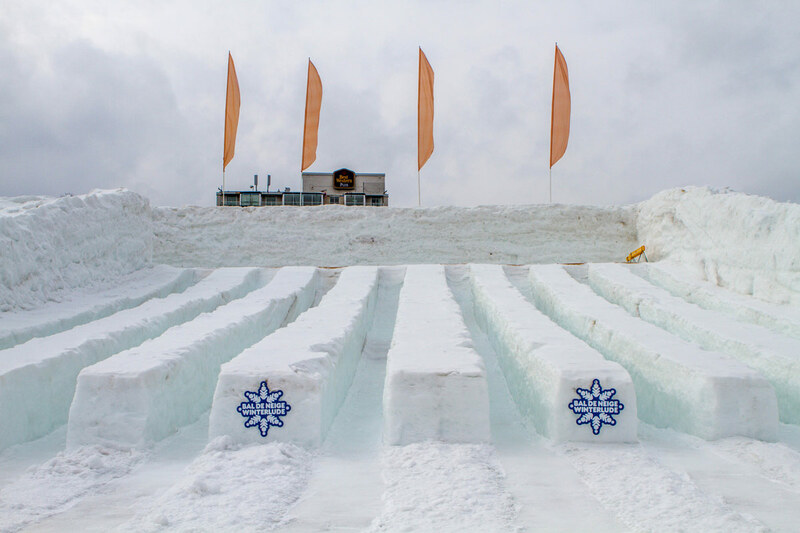 The entrance of the snow maze had an informative display on some amazing attractions that are in the different provinces and territories across Canada in celebration of Canada’s 150th birthday. It was definitely one of the boys’ favorite activities at this year’s Winterlude. One section of Snowflake Kingdom was devoted to life-size games such as Tic Tac Toe and Connect Four. For those that prefer a traditional playground, head over to the Kiddie Zone. There are different shows on each year. This time we got to witness an amazing acrobatic performance. Even with the cold weather, D did not ask to leave early. He was absolutely mesmerized by these amazing athletes. Plus, there was a trampoline wall! The main draw of Confederation Park in Ottawa are the ice sculptures in Crystal Garden. Around the park are several sculptures. A lot of them encourage interaction. At night they are illuminated giving them a magical glow. The boys favorite was an ice castle which they proceeded to use as an ice slide. 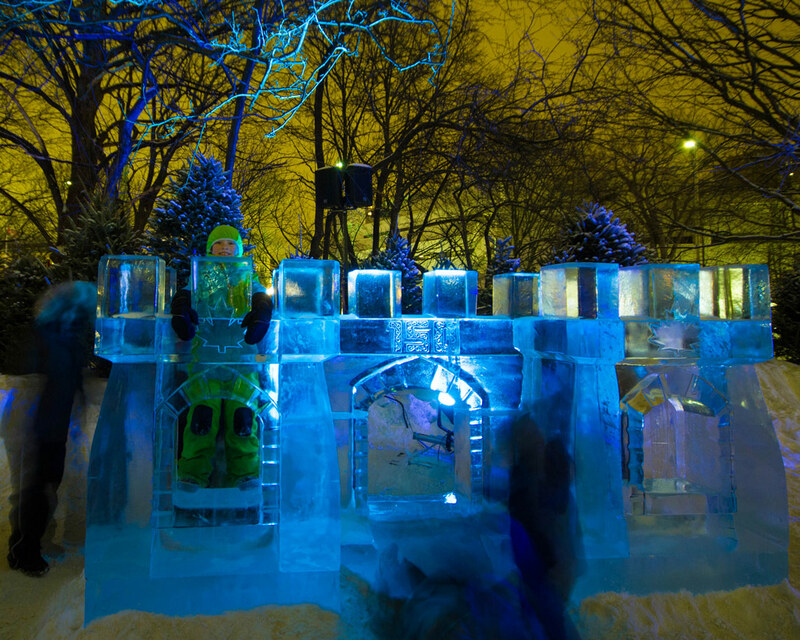 Confederation park also houses the ice sculptures from the annual International Ice-carving Competition. These are set behind a rope barrier as most are very intricate with some delicate pieces. The Gatineau side of Winterlude hosts the snow sculptures. There are various sculptures artfully scattered throughout Jacques-Cartier Park. Also, new in 2017, there is a dedicated section for the more elaborate sculptures for the National Snow Sculpture Rendezvous. Similar to the ice sculptures, the snow sculptures are lit at night and take on a surreal quality. 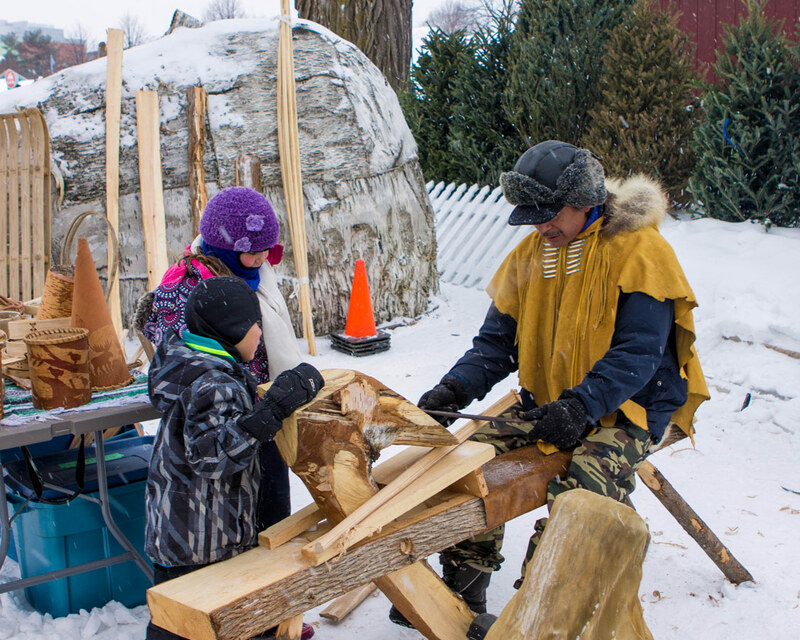 The boys love hearing folk stories and some of the best stories are told over a roaring fire at the makeshift Aboriginal village in Jacques-Cartier park. Here, visitors learn from Indigenous people how to make traditional foods such as bannock and about other aboriginal traditions. This year, C even spotted a drum that looked exactly like the drum he made as part of the Great Spirit Circle Experience on Manitoulin Island. For children age 5 – 8 years, it is possible to go Downhill skiing at the Snowflake Kingdom for free! All equipment is provided and there are instructors to talk the children through the process. 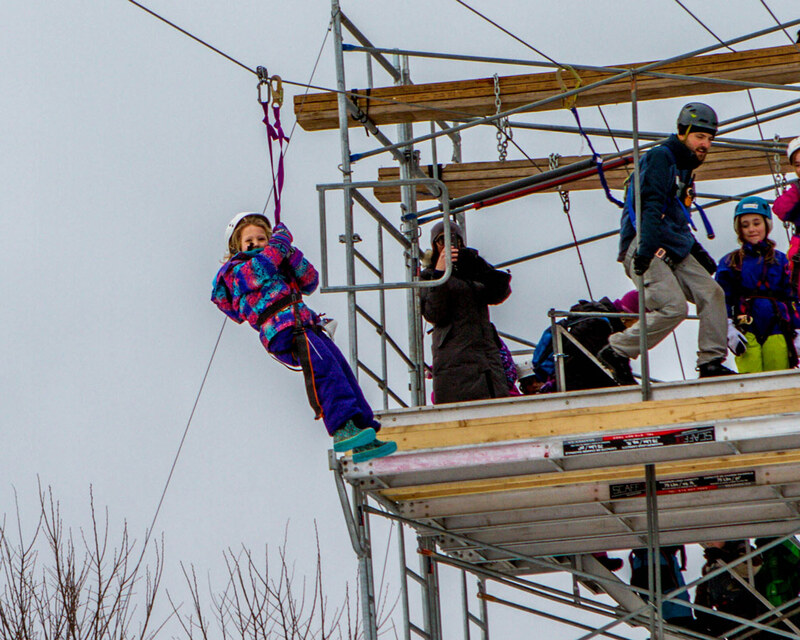 For older children, it is also possible to go zip lining. You must be over 42″ tall. I heard the views from above were amazing. Of course, no WanderingWagars adventure would be complete without tasting some local food. There are places at both locations where you can buy some typical Canadian fare. 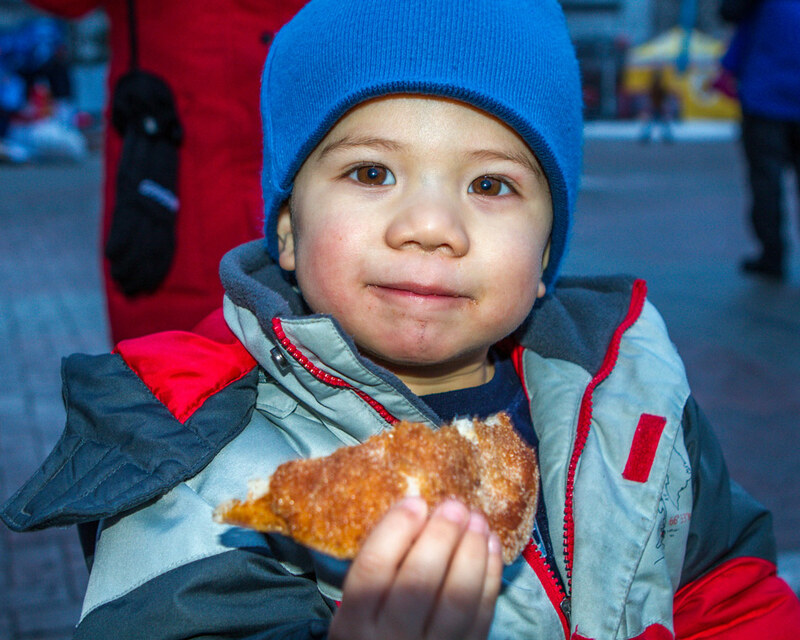 We opted for the very popular Beaver Tails (a fried dough pastry drenched in cinnamon). But it is also possible to buy poutine (french fries with gravy and cheese curds) or maple taffy (solidified maple syrup on a stick). For full meals, many restaurants in the area feature Canadian specialties with wine pairings featuring Canada’s famous wines including some award winning Ice Wines for dessert. 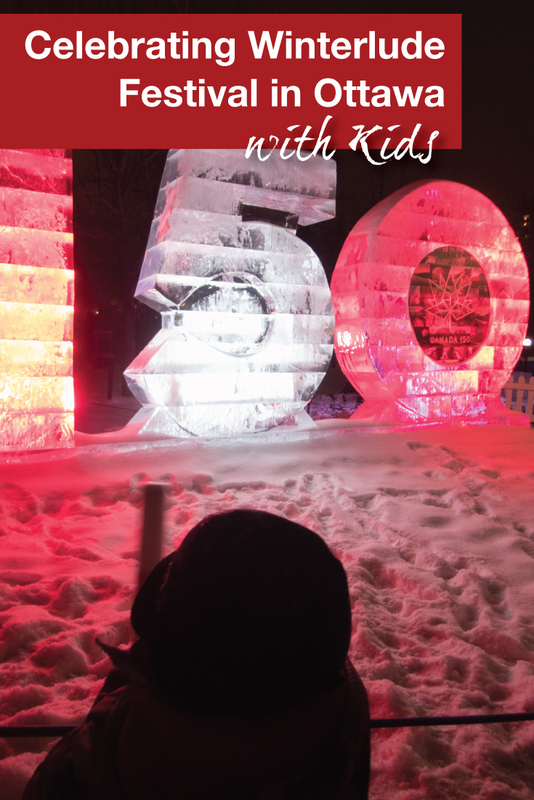 Why go to Winterlude with kids? 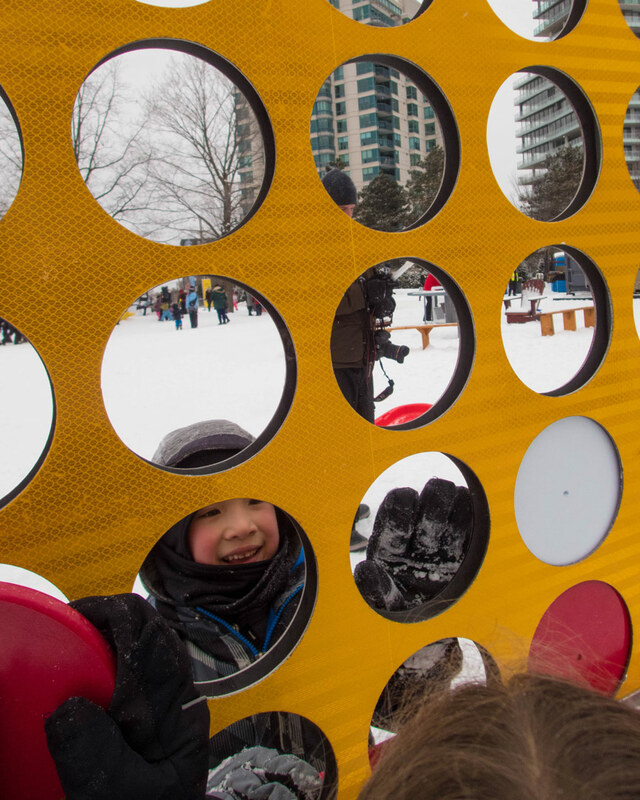 Hopefully, after reading all the activities you can do with kids you are convinced what a fun weekend getaway Winterlude is! The best part of all for us is that besides the food, all the activities are free. What an affordable way to spend a wonderful weekend enjoying winter at it’s best. What is your favorite winter festival?